SharePoint 2019 Public Preview je konečně dostupný! SharePoint 2019 Public Preview je konečně ke stažení a slibuji vám, že se můžete těšit na opravdovou nadílku nových funkcí a vylepšení. Změn je takové množství a jsou natolik zásadní, že se dá mluvit o podobné evoluci, kterou jsme naposledy zažili při přechodu z SharePoint 2010 na SharePoint 2013. Pokud zde nevidíte InfoPath Services, nemusíte se obávat i v rámci SharePoint 2019 Public Preview jde pouze o Deprecated Features, tedy neměla by se používat, ale dále a dále je podporována :-). Výpis všech nových, vylepšených, nedoporučených a odebraných funkcí v rámci dokumentace k SharePoint Server 2019 Public Preview. The Access Services 2013 service application now supports the SendEmail action for sending email messages from apps. See Introducing Send Email in Access 2013 web apps for more details. We’ve made it easier for farm administrators to reach the latest SharePoint administration documentation and find the latest Public Updates by adding links in the SharePoint Central Administration homepage. Communication sites are a place to share news, showcase a story, or broadcast a message to other people. The new Hero web part can display up to five items with compelling images, text, and links to draw attention to your most important content. Users can easily create communication sites for themselves from SharePoint Home without needing to contact IT. We now support storing files up to 15 GB in SharePoint document libraries. This is up from 10 GB in SharePoint Server 2016. SharePoint Server 2019 Public Preview contains the modern experiences for lists and libraries in Team sites. This brings the experience up to date with that found in SharePoint Online. SharePoint Server 2019 Public Preview now supports modern sharing experiences with a simplified sharing UI. You can now easily share links to content with others in your organization. You can also be warned if you’re sharing to a large group or sharing a large number of items. 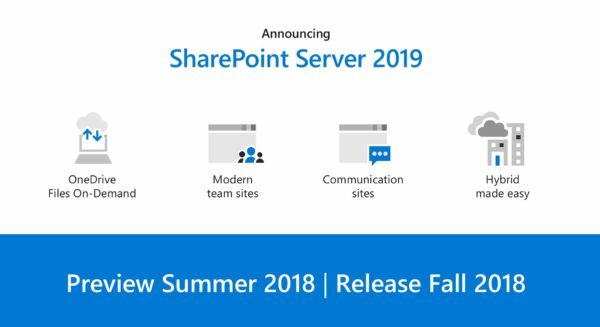 SharePoint Server 2019 Public Preview users can now add modern site pages and modern web parts on team sites. Do this in the Add a Page in Site Actions or in the pages library by clicking New > Site Page. SharePoint Server 2019 Public Preview now also offers a modern search experience. In the modern search experience, users see results before they start typing, and the results update as they type. The search results page shows a compelling overview of search results, grouped by type. It’s easy to expand to see all the results of each type, for example people or sites. On a people result, users can click the email address to quickly get started on an email to that person. The modern search experience is available from the SharePoint home page, modern sites, and modern document libraries. Modern team sites bring a fresh and responsive user experience to team collaboration. The redesigned homepage improves the discoverability of the most common collaboration tasks while putting your team’s news front and center. Users can easily create modern team sites for themselves from SharePoint Home without needing to contact IT.SharePoint Server 2019 Public Preview will continue to support creating classic team sites. SharePoint Server 2019 Public Preview can now render PDF documents on the server. Users no longer need to rely on a PDF viewer client application. The SharePoint home page is a modern UI experience that gives users unified access to all of their sites—online and on-premises. 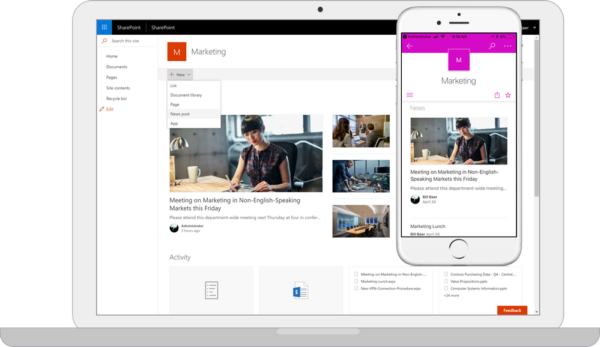 It allows users to navigate seamlessly through their intranet, catch up with activity across their sites with just a glance, and provides a personalized view of all team news.The SharePoint home page is also the launching point for users to create new, modern sites on a self-service basis. The self-service site creation experience in the SharePoint home page now supports creating new sites in a different web application, regardless of whether the web application is hosted on the local farm or a remote farm. This is controlled by the When users select the Create site command, create setting on the Self-service Site Collection Management page in Central Administration. The self-service site creation experience on the SharePoint home page now fully supports non-Default Alternate Access Mapping (AAM) zones. When creating sites in a different web application on a remote farm, make sure that an external resource has been created in AAM on both the local farm and the remote farm. This applies to sites created in the same web application, sites created in a different web application on the local farm, and sites created in a different web application on a remote farm. SharePoint Server 2019 Public Preview now supports authenticating to SMTP servers when sending email messages. Authentication can be configured through the Central Administration website and through PowerShell. SharePoint Server 2019 Public Preview will still support anonymous connections to SMTP servers that don’t require authentication. This makes it easier for customers to integrate SharePoint into highly secure environments where authentication is required to send emails. Customers no longer need to configure smart host relays for SharePoint in these environments. For more information, see Plan outgoing email for a SharePoint Server farm and Configure outgoing email for a SharePoint Server farm. Users can use the new OneDrive sync client (NGSC – Next Generation Sync Client) instead of Groove.exe to sync files in your SharePoint Server 2019 Public Preview team sites and personal sites with your devices. The OneDrive sync client supports advanced features such as Files On-Demand, push notification, and IRM protection, while still being easy to use. For more information, see Deploy the new OneDrive sync client for Windows and Deploy and configure the new OneDrive sync client for Mac. Distributed Cache will now configure AppFabric Velocity Cache to use background garbage collection. This helps provide a more reliable experience for features that depend on Distributed Cache. SharePoint Server 2019 Public Preview has increased the maximum file path length limit from 260 characters to 400 characters. The file path is everything after the server name and port number in the URL. File path includes the name of the site and subsites, document library, folders, and the file itself. This file path length limit increase makes it easier to sync deeply nested content from personal storage devices to SharePoint. The „OneDrive by Default“ experience for SharePoint Server 2013 is now available in SharePoint Server 2019 Public Preview. When enabled, any attempt to browse to the My Site Host welcome page will be redirected to Office 365. A SharePoint hybrid status bar was added to the top of Central Administration. The hybrid status bar will appear once the SharePoint Server 2019 Public Preview farm meets the minimum system requirements needed to enable hybrid, and will give you direct access to launch the SharePoint Hybrid Configuration Wizard. We’ve added and updated hybrid links throughout Central Administration to launch the SharePoint Hybrid Configuration Wizard. This lets you skip clicking through multiple pages in the SharePoint Online Admin Center just to get to the SharePoint Hybrid Configuration Wizard. SharePoint Server 2019 Public Preview users can now restore items that they’ve deleted themselves, and also items that other users in the site have deleted. Users need edit permission on the deleted items so they’re visible in their SharePoint recycle bin. Sharing email notifications have been refreshed to use a modern template design. Customers can set the SPWebApplication.SharingEmailUseSharePoint2016Templates property to true if they want to continue using the previous sharing email template. We’ve refreshed Suite Navigation and App Launcher in SharePoint Server 2019 Public Preview. The user interface now is closely aligned with what is seen in Office 365 so that SharePoint hybrid customers will have a seamless experience as they move between SharePoint Server 2019 Public Preview and SharePoint Online. SharePoint Server 2019 Public Preview now has an updated telemetry management experience. When you first set up a farm or browse to the SharePoint privacy settings page in Central Administration, you can now provide an email address for the telemetry contact of your organization. This is in anticipation of future telemetry reporting capabilities that will allow customers to associate SharePoint Server and OneDrive Sync Client telemetry with their hybrid tenancy. Get-SPContentDatabase – You can now use the Get-SPContentDatabase cmdlet with the optional parameter -DaysSinceLastProfileSync to return content databases that haven’t been synchronized with User Profile for the past n days. Clear-SPContentDatabaseSyncData – The new Clear-SPContentDatabaseSyncData cmdlet clears User Profile synchronization information from the content databases in the farm that haven’t been synchronized for the past n days. Update-SPProfileSync – The new Update-SPProfileSync cmdlet updates the User Profile synchronization settings to specify the main synchronization schedule, the sweep schedule to identify new users, and which web applications should be excluded from synchronization. The „stsadm.exe -o enumallwebs“ command has been converted into a PowerShell cmdlet. You can now use the new Get-SPContentDatabaseOrphanedData cmdlet to find orphaned objects within a content database. The „stsadm.exe -o enumallwebs“ command will still be supported for backward compatibility. The „stsadm.exe -o setapppassword“ command has been converted into a PowerShell cmdlet. You can now use the new Set-SPApplicationCredentialKey cmdlet to set the application credential key on the local server for the SharePoint People Picker and SMTP authentication. The „stsadm.exe -o setapppassword“ command will still be supported for backward compatibility. The new Remove-SPApplicationCredentialKey cmdlet allows you to remove the application credential key from the local server. The impact level of this cmdlet is set to high, as removing the application credential key from the local server may degrade or block the functionality of features if they’re configured to use the application credential key. For example, the SharePoint People Picker or SMTP authentication. SharePoint has added a new health analyzer rule for the People Picker. This health analyzer rule detects if servers in the farm are missing the encryption key needed to retrieve People Picker credentials, such as when the People Picker is configured to search for users in another forest or domain with a one-way trust to the SharePoint farm’s domain. If so, it will notify the SharePoint farm administrator so that they can correct the problem. For more information, see One or more servers can’t retrieve People Picker credentials. SharePoint has added a new health analyzer rule for SMTP authentication. This health analyzer rule detects if servers in the farm are missing the encryption key needed to retrieve the credentials for authentication. If so, it will notify the SharePoint farm administrator so that they can correct the problem. For more information, see One or more servers can’t retrieve the outgoing email credentials. Access Services 2010 will remain supported, but deprecated, for the SharePoint Server 2019 Public Preview release. Customers are recommended to explore Microsoft PowerApps and Flows as potential alternatives to Access Services 2010. Access Services 2013 will remain supported, but deprecated, for the SharePoint Server 2019 Public Preview release. Customers are recommended to explore Microsoft PowerApps and Flows as potential alternatives to Access Services 2013. The aggregated newsfeed feature (available at newsfeed.aspx and typically accessed via the Newsfeed tile on the app launcher), will be set to read-only in SharePoint Server 2019 Public Preview. Both the tile in the app launcher and the option to implement the newsfeed capability will also be removed from this version forward. For customers who are currently using the aggregated newsfeed, we recommend considering options such as Team News, Communication Sites, Yammer and/or Teams. Please note that the Site Feed feature on an individual site is not impacted and will continue to be supported across all versions of the product. To ensure that users receive highly relevant help content, Microsoft is moving from away from our legacy on-premises SharePoint help engine, which is based on help collections being installed in the on-prem farm. The new SharePoint help system is now rendered in the cloud and will have updated, synchronized content with Office 365. Custom help based on the legacy SharePoint help engine will remain supported, but deprecated, for the SharePoint Server 2019 Public Preview release. The Groove sync client is our client for syncing documents between your personal devices and SharePoint Server 2010, 2013, and 2016 Team sites. SharePoint Server 2019 Public Preview introduces support for the new OneDrive Sync Client (a.k.a. the Next Generation Sync Client), which provides a more reliable and feature-rich syncing experience. If Groove detects that your existing sync relationships are to a site that has been upgraded to SharePoint Server 2019 Public Preview, it will attempt to migrate those sync relationships to the OneDrive Sync Client. Administrators can control this migration experience. The Groove sync client will remain supported, but deprecated, for the SharePoint Server 2019 Public Preview release. As we announced in the Microsoft 365 blog, InfoPath Services is a deprecated feature and customers are advised to explore alternatives for this feature. InfoPath Services will remain supported, but deprecated, for the SharePoint Server 2019 Public Preview release. There will not be a new InfoPath client shipped with this release. Microsoft will ensure that the InfoPath 2013 client will work with SharePoint Server 2019 Public Preview for the remainder of the client support lifecycle (2026). InfoPath 2013 client will not be supported beyond that timeframe. The following SOAP endpoints in the Lists web service depend on the Microsoft Sync Framework, which was necessary to support the Groove sync client. Because the Groove sync client is now a deprecated feature, these SOAP endpoints are also being deprecated for the SharePoint Server 2019 Public Preview release. The Machine Translation Service will remain supported, but deprecated, for the SharePoint Server 2019 Public Preview release. PerformancePoint Services has a significant dependency on Microsoft Silverlight, which is a technology that will no longer be supported as of October 12, 2021. PerformancePoint Services will remain supported, but deprecated, for the SharePoint Server 2019 Public Preview release. Customers are recommended to explore Microsoft PowerBI as an alternative to PerformancePoint Services as we are making many new business intelligence investments in PowerBI. There will not be a new SharePoint Designer client shipped with this release. Microsoft will ensure that SharePoint Designer 2013 will work with SharePoint Server 2019 Public Preview for the remainder of the client support lifecycle (2026). SharePoint Designer 2013 will not be supported beyond that timeframe. As we announced in the SharePoint Community Blog, site mailboxes are being deprecated in SharePoint Online. Site mailboxes will remain supported, but deprecated, in the SharePoint Server 2019 Public Preview release. Customers are recommend to explore shared mailboxes as an alternative to site mailboxes. The main functionality of Site Manager is now available in modern file move. The Site Manager feature will be supported, but it is deprecated in SharePoint Server 2019 Public Preview. Only site collection administrators will have permission to access the Site Manager page and the UI entry points to this page will be removed. As announced in the Microsoft Office Dev Center and previous articles, code-based sandbox solutions were deprecated in SharePoint Server 2013 and have now been removed in SharePoint Online. After careful consideration, we’ve decided to also remove support for code-based sandbox solutions in SharePoint Server 2019 Public Preview. Customers are recommended to explore SharePoint add-ins as an alternative, which are fully supported for both SharePoint on-premises and SharePoint Online. As announced by the Windows Server team, Microsoft is deprecating the Digest authentication feature in Internet Information Services (IIS). This authentication mechanism isn’t very popular and there are many alternative authentication mechanisms available with better interoperability. To ensure we remain compatible with potential future releases of Windows Server, we are removing support for Digest authentication in SharePoint Server 2019 Public Preview. The SharePoint prerequisite installer will no longer attempt to install this Windows feature. Customers using Digest authentication are recommended to explore alternatives such as Kerberos, NTLM, or SAML. As announced by the Windows Server team, Microsoft is deprecating the IIS 6 Management compatibility features in Internet Information Services (IIS). The automatic mode of the SharePoint incoming email feature relies on IIS 6 APIs to manage the IIS SMTP service. Because no alternative APIs exist to manage the IIS SMTP service, we are removing support for automatic mode in the incoming email feature of SharePoint Server 2019 Public Preview. Customers using incoming email are recommended to use advanced mode instead, which allows you to manually manage the IIS SMTP service and drop folder. As Microsoft continues to innovate in SharePoint Online, an increasing amount of SharePoint multi-tenancy capabilities are taking dependencies on cloud technologies that aren’t available in on-premises environments. The cost and complexity of providing an on-premises alternative has become prohibitive, so we will no longer support multi-tenancy in the SharePoint Server 2019 Public Preview release. Existing SharePoint Server customers who depend on multi-tenancy are recommended to explore migrating to SharePoint Online. Other options include migrating to a non-multi-tenancy farm configuration or remaining with SharePoint Server 2016. Since the feature was first introduced in SharePoint, Microsoft BI strategy has shifted away from heavy integration to a standalone BI solution, Power BI, to give customers a flexible, optional integration with SharePoint along with standalone capabilities. Both PowerBI.comand Power BI Report Server offer the option to host and view Excel Workbooks with PowerPivot models today and is the preferred method for customers going forward to host and use their Excel Workbooks with PowerPivot models, or simply to migrate to PBIX files using the migration option in Power BI Desktop for Excel Workbooks. Visio Services has 2 options for rendering Visio diagrams: Microsoft Silverlight-based and PNG-based. Microsoft Silverlight is a technology that will no longer be supported as of October 12, 2021. This means that, Silverlight-based rendering will no longer be supported in SharePoint Server 2019 Public Preview. Visio Services will only render Visio diagrams using the PNG-based technology. K dispozici je i Language Pack pro SharePoint 2019, tedy je možno stáhnout anglickou verzi a pak doinstalovat češtinu – https://www.microsoft.com/en-us/download/details.aspx?id=57168 .